IREM Leadership Print Publications will help you expand your skill set and provide resources for every step of your career development. No matter your level of experience and expertise. 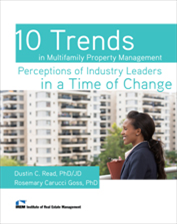 This report is part of IREM’s Real Estate Asset Management Initiative, which explores the points of connectivity between the property management and the asset management professions, as well as ways to help individuals working in both fields collaborate more effectively. It digs deeper into several of the asset management functions identified in IREM’s research report "Real Estate Asset Management: A Process and a Profession", drawing upon ongoing contributions from practitioners representing real estate investment and service firms in the United States. It was written by Dustin C. Read, PhD/JD. The need for leaders at all levels is one of the top critical issues facing all organizations, as identified in an executive survey by Deloitte University Press. This is certainly true in the real estate industry as companies are shifting their focus from being performance driven to relationship driven. Real estate professionals are spending less time in day-to-day operations and more time leading the people who manage properties. Leadership development is a very personal journey—this guide provides a map to leadership excellence. Watch the author Christopher Lee, discuss the book. Exceptional talent guided by core values and standards of excellence is at the foundation of every real estate solution. As the real estate industry approaches 2025 and beyond, the need to re-establish the industry’s valued and often dominant role in the transformation and transition of our society must become a priority. 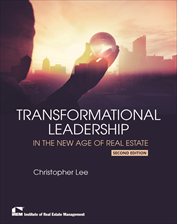 Real estate organizations must revisit the basics, the foundational roots, and strategies that resulted in a legacy of success and deploy contemporary business models to bring real estate back to its former leadership role in society. Future success requires Transformational Leadership, which is the key to sustainability, productivity, profitability, and growth. It sets the tone, provides the vision, and brings out the best in people. During the next decade, individuals who have been asked to lead must not simply manage people or processes—they must be visionary and promote individual entrepreneurship. Most importantly, this publication provides a blueprint for developing the Transformational Leadership your company needs to survive. 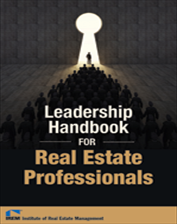 Bonus Feature: Contains 100 predictions that will shape the future of real estate!